The netizens were left in splits with a few supporting his action while others supporting umpire Vinod Seshan, who stopped the bowler and signalled it a dead ball. Hyderabad: The game of cricket is always been seen as a batsman’s game. With most of the laws favouring the batsmen, there were debates once in a while fighting for bowler-friendly rules. 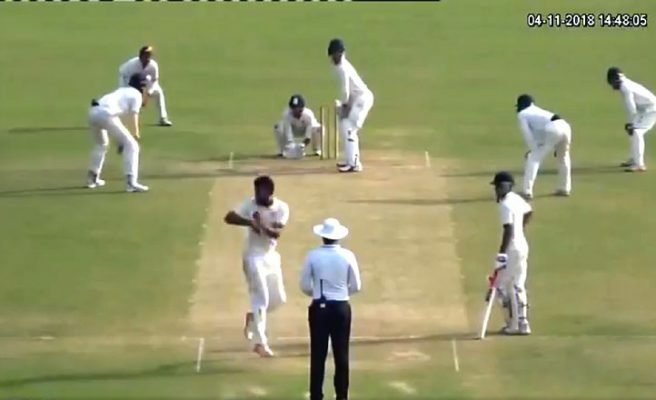 Uttar Pradesh left arm spinner Shiva Singh raked up a debate on the internet when he took a 360-degree turn before delivering the ball in the under-23 CK Nayudu match against Bengal on Wednesday. The netizens were left in splits with a few supporting his action while others supporting umpire Vinod Seshan, who stopped the bowler and signalled it a dead ball. The video went viral when former Indian spin legend Bishan Singh Bedi shared it, “Weirdo…!! Have a close look! !” on his twitter handle. With the advent of T20, the modern batsmen have come out with innovative strokes like reverse sweep, switch hits or Dil-scoops to counter the bowler. In this regards, few netizens batted for the bowler for coming up with a new trick up his sleeves. However, coach John Manoj feels that it was right on umpire’s part to declare it illegal. “It is very simple. There is a proper action that has to be taken before bowling at the point of delivery. The umpire is the sole judge of the game and he can take action at any point of the game. In his purview there are some rules, where you are not supposed to bowl under arm. How can you bowl like that in a first class game? It is surprising. You can’t do anything to distract the batsman before delivering a ball. You can’t dance or jump around and bowl. It is not legal,” he said. When asked on batsmen trying different strokes, he said, “A batsman plays his strokes after the point of delivery. I don’t see any wrong with that,” he added. Former Hyderabad Ranji coach Abdul Azeem too echoed the similar feelings. “It is distracting the batsman. It is basically a batsman’s game. There are rules in his favour. I feel when a batsman is playing a reverse-sweep is also wrong and the laws should be looked into,” he adds.